Sometimes I think that the next Revolutionary War will take place in vegetable garden battlefields, all across America. Instead of bullets, there will be seeds. Instead of chemical warfare, there will be rainwater, carefully collected from the gutters of the house. Instead of soldiers in body armor and helmets, there will be backyard guerrillas, with bare feet, cut-off jean shorts, and wide-brimmed hats. Instead of death, there will be life, sustained by a harvest of home-grown produce. Children will be witness to these battles, but instead of being traumatized, they will be happy, grimy, and healthy, as they learn about the miracles that take place in a little plot of land or pot of dirt. Don’t worry if you aren’t trained in this kind of warfare. The Home Grown Food Summit is an absolutely free online workshop for training gardening guerrillas. Every day, Big Agri and Big Biotech take steps towards food totalitarianism. They do so flying a standard of “sustainability” but what they are actually trying to sustain is NOT our natural resources, but their control. Does it sound dramatic to state that if things continue on their current path of “sustainability” that we are all going to die? If you think I’m overstating this, read on. The case is clear that we are going to soon be “sustained” right into starvation via Agenda 21. The European Union is in the process of criminalizing all seeds that are not “registered.” This means that the centuries-old practice of saving seeds from one year to the next may soon be illegal. Collecting rainwater is illegal in many states, and regulated in other states. The United Nations, waving their overworked banner of “sustainability” is scheming to take over control of every drop of water on the globe. In some countries people who own wells are now being taxed and billed on the water coming from those sources. Nestle has admitted that they believe all water should be privatized so that everyone has to pay for the life-giving liquid and they continue to pump millions of gallons out of California, despite the fact that the nation’s major food-producing state is being crippled by its fourth year of drought. Regulations abound in the 1200-page Food Safety Modernization Act that will put many small farmers out of business, while leaving us reliant on irradiated, chemically treated, genetically-modified “food”. Growing your own food wields many weapons. You are preserving your intelligence by refusing to ingest toxic ingredients. Many of these ingredients (and the pesticides sprayed on them) have been proven to lop off IQ points. You are avoiding GMOs. More and more foods are genetically modified. If you purchase processed food, there’s a very good chance you’re consuming genetically modified organisms. GMOs are not only an unknown health factor, but most are either heavily sprayed with pesticides or have the pesticide built right in. You are not susceptible to the control mechanisms and threats. If you are able to provide for yourself, you need give no quarter to those who would hold the specter of hunger over your head. You don’t have to rely on anyone else to feed your family. Maybe you haven’t yet grown a garden because you aren’t sure how to get started. Maybe you have a track record as a tomato plant serial killer. Maybe you live in the city or have an HOA. Don’t despair! There are still more ways than you ever imagined to get down and dirty! The Home Grown Food Summit is going on this coming week. Each day there are 4 or 5 workshops. Don’t worry about your schedule, because they’ll each be available to listen to for 24 hours. This is a once-a-year event. Don’t miss it! This is free information, and I really want everyone to have access to it. There is a food revolution brewing. People who are educating themselves about Big Food, Big Agri, and the food safety sell-outs at the FDA are disgusted by what is going on. We are refusing to tolerate these attacks on our health and our lifestyles. We are refusing to be held subject to Agenda 21’s version of “sustainability”. Firing a volley in this war doesn’t have to be bloody. Resistance can begin as easily attending an online workshop. 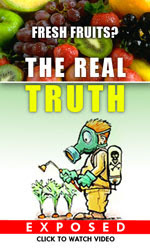 I promise, you’ll be inspired to fight dirty after attending the Home Grown Food Summit. Daisy Luther lives in a small village in the Pacific Northwestern area of the United States. She is the author of The Organic Canner, The Pantry Primer: How to Build a One Year Food Supply in Three Months, and the soon-to-be-released The Prepper’s Water Survival Guide: Harvest, Treat, and Store Your Most Vital Resource. On her website, The Organic Prepper, where this article first appeared, Daisy uses her background in alternative journalism to provide a unique perspective on health and preparedness, and offers a path of rational anarchy against a system that will leave us broke, unhealthy, and enslaved if we comply. Daisy’s articles are widely republished throughout alternative media. You can follow her on Facebook, Pinterest, and Twitter.